Robert Morus founded Phelps Creek Vineyards to focus on estate grown Pinot Noir and Chardonnay. He was raised in the San Francisco Bay Area and experienced the Northern California wine explosion first hand. After serving in the Air Force and becoming a Delta Airlines pilot, he chose to becoming based in Portland, Oregon, hoping to plant a vineyard that was a sensible driving distance away. His first trip to explore the wine districts of Oregon led him to the Columbia Gorge, where he found a 60-acre site perfect for grapevines with a steep southern slope and a magnificent view of the Hood River Valley. He also explored the Willamette Valley but was drawn back to the Columbia Gorge site. The visually stunning Columbia Gorge wine region is located less than 60 miles east of Portland, Oregon. Over 30 different grape varieties are grown within this 40 mile stretch of diverse microclimates. The land is defined by the Columbia River as it cuts through the Cascade Mountain Range and makes its journey to the Pacific Ocean. The Columbia Gorge wine region is unique in that it is composed of wineries and growers on both shores of the river in Oregon and Washington. The Columbia Gorge is part of two appellations (AVAs) including the western edge of the Columbia Valley AVA, and encompassing all the Columbia Gorge AVA, which was established in 2004. The Columbia Gorge is a relatively new wine region, long known for pears, apples, cherries and other fruits. It wasn't until the 1970s that growers started planting wine grapes. Currently, over 70% of Gorge-grown grapes are exported to other wine regions in Oregon and Washington. There are now more than 30 wineries and 45+ vineyards dotting the shoreline of the Columbia River in the Columbia Gorge winegrowing region. Relaxed, uncrowded tasting rooms offer a special experience. Visit www.columbiagorgewine.com for a touring map and brochure. The name of the winery is derived from a tributary of the Columbia River that runs a path just below the Phelps Creek vineyards. 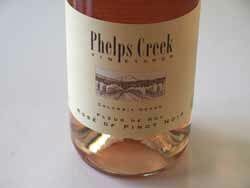 The creek is named after Phelps who was a cooper and died in a tragic rafting accident on the Columbia. The estate vineyards consist of 30 acres of Pinot Noir and Chardonnay, both self-rooted and grafted plants with initial plantings of Pinot Noir dating to 1990 and Dijon clone Chardonnay in 1992. From the initial 7 acres, planting has incrementally increased, and today there are 25 acres of Pinot Noir (Pommard, Dijon 777 and 115), 4.5 acres of Chardonnay (mostly Dijon 75 and 76 and 200 plants from cuttings of Celilo Vineyard’s Wente clone), and .5 acre of Pinot Gris. Elevation ranges from 950 feet to 1,200 feet (600 feet would be considered high in the Willamette Valley), and soils are primarily volcanic. 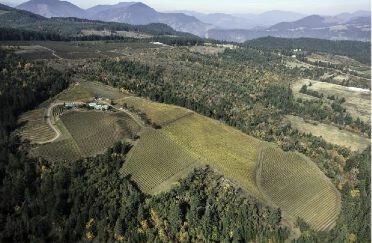 The first harvests went to King Estate and later Ponzi Vineyards, with winemaker Peter Rosback producing a Phelps Creek vineyard-designated Pinot Noir from 2000 to 2006. 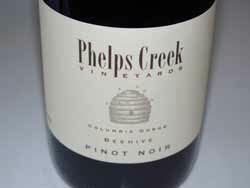 The first Phelps Creek Pinot Noir started with the 2002 vintage, and by 2007 Phelps Creek kept all estate grapes for their own production. 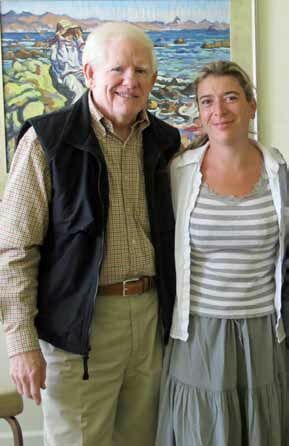 In the same year, Robert met Alexandrine Roy and coaxed her into joining the Phelps Creek team. Alexandrine Roy, who crafts some of the most elegant wines in Gevrey-Chambertain at her family’s Domaine Marc Roy, became a contributing winemaker at Phelps Creek initially, eventually becoming the Director of Winemaking beginning with the 2012 vintage. A fourth generation winemaker, Alexandrine flies to Oregon three or four times a year to oversee the winemaking at the estate. From 2007 through 2011, she primarily made Cuvée Alexandrine, a reserve level Pinot Noir, Fleur de Roy Rosé of Pinot Noir and most recently Coeur de Roy Pinot Noir Blanc. In 2011, wine production was moved to a facility on the estate. Since she took over the reigns, the wines have become spectacular. Photo below is of Alexandrine at a previous IPNC event. Current production is 5,000 cases annually primarily from estate grown fruit including Pinot Noir, Rosé of Pinot Noir, Chardonnay, Pinot Gris and Pinot Noir Blanc (a Merlot and Syrah are from sourced grapes). The winery’s tasting room is located on the Hood River Golf Course and is open daily. 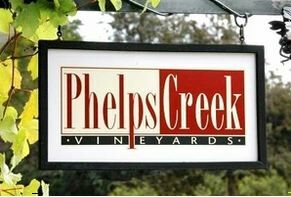 Visit www.phelpscreekvineyards for more information or to order wine. Robert continues his duties as a Captain flying B-777s internationally for Delta Airlines, and his daughter, Becky, has joined the team as Operations Manager and his son, Toby, as Hospitality Coordinator.